Can you guess which states have the highest and lowest subsidizes per student for their colleges? I would have thought California would have spend the most but I was wrong. I found the data from Trends in College Spending 1999 to 2009 from the Delta Project I got the data below out of figure 19 from their report. Below is a table listing each state and giving the average amount of spending per student looking at Net tuition versus state subsidies. This data is specific to public research universities and smaller schools will differ. As you can see there is a huge difference from state to state. Net tuition varies from $4,310 in Wyoming up to $17,797 in Vermont. Subsidy levels range from just $1,828 in Rhode Island all the way up to $20,283 in oil rich Alaska. Alaksa has the lowest % share paid by students at 20% and Rhode Island students pay the most at 87%. The Great Pacific Garbage Patch : Is it really a Vast trash dump? Note : Today's topic has nothing much to do with personal finances. Have you heard about the so called Great Pacific Garbage Patch? Theres a large amount of trash floating around out in the middle of the Pacific Ocean. By some accounts there is a giant pile of trash the size of America floating in the middle of the Ocean. If you picture this in your mind you get an image of a vast expanse of junk for as far as the eye can see. Sometimes when people talk about the Giant garbage patch you'll see close up images showing a bunch of garbage floating in water. In fact you really only see close up images of floating trash or pictures of individual pieces of trash. Worse yet if you do a Google search for images for "Great Pacific Garbage Patch" then you get a lot of pictures of piles of trash floating near beaches which certainly are NOT in the middle of the ocean. If this garbage patch was so big and dense then wouldn't we be seeing real aerial photos of vast amounts of trash? Why only close up or fake pictures? The reason is that the amount of trash out there isn't all that much relative to the vast size of the ocean. There aren't large clumps of junk nor vast areas covered in trash. How much trash is there really? How dense is the trash really? From some accounts the garbage patch is supposed to be 2 times the size of Texas. Or maybe not, it could be only twice the size of Hawaii. Texas versus Hawaii is a pretty large margin of error in the estimates. How much garbage there is is another measure. According to this report there is 5,114 g / km sq in the area. I'm not sure how accurate that measurement is but its one of the only ones I could find. Disclaimer: I'm using rough math here. I'm starting with estimates ranging from the size of Texas to the size of Hawaii so I think that rough figures are good enough. For discussion sake lets assume that its twice as big as Texas and the 5,114 g/km sq figure is accurate. Texas is 695,622 km sq. or twice that is 1,391,244 km sq total. Then that would mean there is 7,114,821 kg or about 15.6 Million pounds of waste floating in the area. From Wikipedia, : "Americans generate more waste than any other nation in the world with 4.5 pounds of municipal solid waste (MSW) per person per day" So per person we put out 4.5 pounds of trash a day. There are around 300 million people so thats 1.35 Billion pounds of trash a day. The mass of the trash floating in the Great garbage patch is equal to roughly 1% of Americas daily trash output. That could be a worst case scenario. Of course by comparing the amount of trash to American trash output I'm not meaning to imply that all the trash came from America either. Many countries border the Pacific and contribute to the trash and much of the trash is from ships not owned by America. Lets go back to that 5,114 g / km sq figure. 5,114 g in a Km squared is not a lot. KM squared is a very large area. Thats 1,000,000 square meters. That means theres roughly 0.005 grams per squared meter. A gram is actually a very small amount so 0.005 grams is extremely small. A zip lock bag ways about 1-2 grams. So we're talking about a piece of plastic which is about 1/200th to 1/400th the size of a 3" square zip lock bag. That would amount to something about 30 sq milimeters. 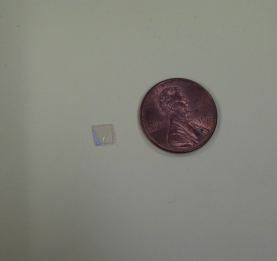 Or a speck of plastic roughly 5x6 mm. Lets see what a 5 mm x 6mm fleck of plastic looks like. Well it kinda looks like that when I size the image so it can actually fit in this blog it makes the bit of plastic sooo tiny that you can't see it so I had to circle it in orange so something would actually show up. One research expedition by the Algalita Marine Research Foundation traveled 2,000 nautical miles across the Atlantic and reported "During the expedition, 100 pieces of floating marine debris were sighted." On average thats 1 item spotted per 20 miles traveled. Keep in mind this is a research foundation which is trying to bring attention to the problem so they aren't likely to under report the amount of trash. Hardly a vast see of junk. But again it should be stressed that much of the trash in the ocean is small bits and a lot of it is below the surface. There isn't a vast giant pile of trash floating in the middle of the Pacific Ocean. There is however tons and tons of plastic bits that are floating out in the ocean. The ocean his so vast that those little plastic bits are more often tiny bits of plastic or maybe a single discarded mylar balloon every few miles. Please don't misunderstand me.... any amount of plastic floating around in the ocean is not a good thing. The more plastic out there the more harm it does to fish and wildlife and contaminates the environment. Yesterday I showed the historical trend for natural gas prices nationally. Today I'll continue the fascinating discussion of natural gas prices by looking at the price for each state. I once again got the information from the U.S. Energy Information Administration. For comparison also see my previous article on average electricity cost by state. Below are the prices for each state in dollars per 1000 cubic feet of natural gas. These are average residential rates per state. The US Energy Information Administration tracks natural gas prices. 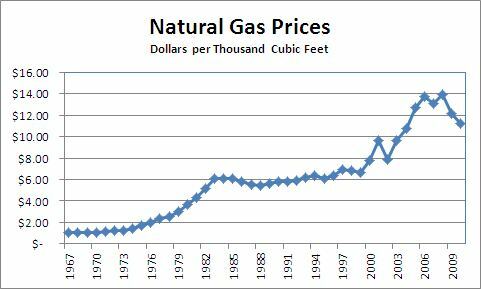 They have data on the prices of natural gas going back to 1967. Here is the history of prices shown graphically. These are the US national average prices per 1000 cubic feet of gas. From 1967 to 2010 the price grew at an average annual rate of 5.2%. It looks like prices grew drastically this past decade but the drop 2008 to 2010 actually lessens that trend considerably. Between 1999 and 2010 the costs rose at a rate of 4.8%. A short sale is when you make an agreement with the bank where they allow you to sell your home at market value even though your mortgage balance owed is more then that. The bank basically takes the loss in this manner as opposed to having to foreclose and then sell it themselves. One benefit of short sale cited by many is that it is not supposed to hurt your credit score as badly as a foreclosure. OCShortSaleNow makes it sound pretty good saying : "Following a successful short sale your mortgage will be reported on your credit score as either paid or negotiated, lowering your score as little as 50 points and affecting you for only 12 to 18 months. " An About.com article on the topic is much less optimistic : "The ding on credit will show up as a pre-foreclosure in redemption status, Steep says, which will result in a loss of 200 to 300 points." Thats a huge difference in impacted given by those two sources. The difference between 50 points and 300 points on a credit score is gigantic. How much does a short sale really impact your credit score?? First of all we need to know a little about how the short sale shows up. A QA post on the Experian website points out that "The term “short sale” does not actually appear in a credit report. So, the important concept to understand before you agree to your lender’s terms is how the mortgage loan will be closed and reported in your credit history." For a good answer, lets go to the source. This article on the FICO website cites different ranges of impacts to scores for foreclosures shortsales and the like. They have a couple tables there showing numbers. You can read their article for the source. I consider the information from FICO to be the definitive answer on this topic since they are the ones that make the actual FICO credit scores. If anyone can tell us the right answer it would be FICO. FICO's info tells us that the actual hit to your credit score from a short sale will depend on where your credit score starts in the first place and how the short sale is reported on your credit report. If your score is lower to begin with then the hit to your score won't be as bad as you'll have less to fall. For someone who starts with a credit score of 680 the impact from a short sale is 50 to 105 points. If your score is much higher at 780 level then it could drop 105 to 160 points. When a short sale is reported with a deficiency balance that will hurt your score more than if the short sale is not reported with a deficiency. From the numbers on the FICO site the difference between deficiency and no deficiency is 35 points. The FICO data also shows a range of 20 points for any specific situation. The impact to someone might vary 20 points depending on the exact specifics of their situation. The credit score formula is pretty complex so you'd have to look at all the other factors involved. I'm not sure how or why the impact from a short sale could vary 20 points but maybe if you have great credit otherwise the single short sale won't ding you nearly as much or maybe the opposite is true. Ultimately you'll end up with a credit score in the low to mid 600 range. I'd assume your credit score will be 600-650 after the short sale is done. SmartMoney talks about The Fuzzy Math of Home Values that is seen with online appraisal sites like Zillow. My Broken Coin considers Pet Insurance: Is It Worth It? The CreditKarma site has data they compiled on average credit score trends versus age groups. I think that it makes sense that on average older people will have better credit scores. I can guess of a few reasons why this general trend would occur. For one older people will have a longer history of credit and more years to compile a credit history. One of the factors in your credit score is the length of your credit history. Its impossible for someone 22 years old to have a 20 year credit history but not at all hard for someone in their 40's. People make more money as they get older and with a higher income its easier to handle your finances. Its a lot easier to get go into default if you are getting paid $10 an hour than if you make $25 per hour. As people age they learn and get wiser and generally 'settle down'. I made some mistakes with my credit cards when I was in my 20's but I've since learned from those mistakes and will know better now. I'm not the only person who goes through this experience. This is a bit of a generalized stereotype of course. I'm not saying young people are irresponsible and simply aging makes you good with finances. Many people will do the opposite and are smart with their finances early or end up in credit trouble later in life. Today I'm just going to pull out the latest total numbers. I highlighted the broader categories in yellow. Each broader category is the sum of the occupational areas within it. 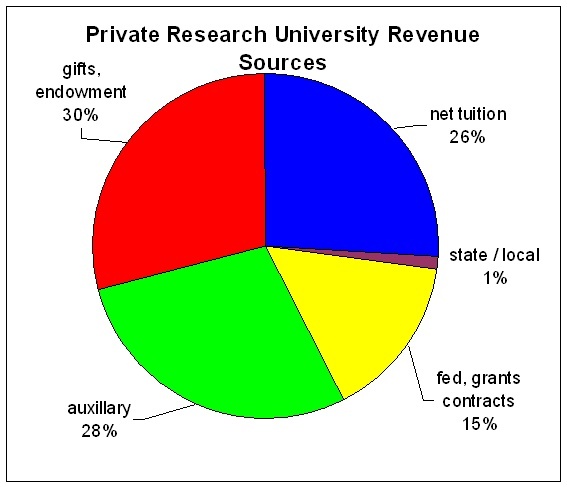 The other day I asked Where Do Universities Get their Money From? 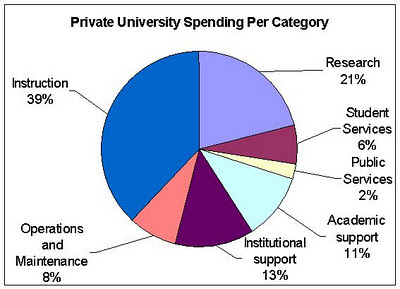 Today lets take a look at the other side and see where universities spend their money. I once again got the data from he Delta Project in their study on Trends in College Spending 1999 - 2009 The figures I used are all out of that study and represent average spending per full time equivalent student. 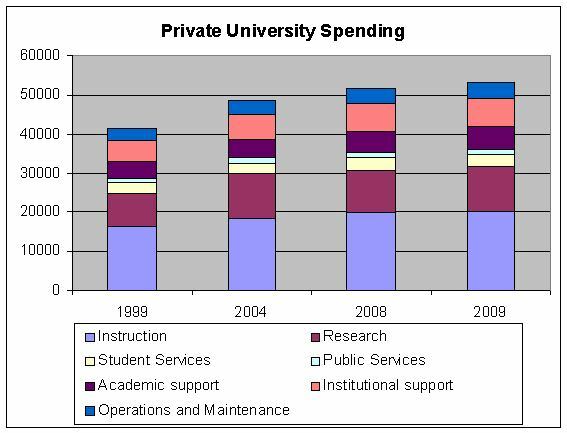 I am only looking at public research universities and private research universities. The spending for smaller schools and community colleges is different. I am also not looking at the costs for scholarships or for auxillary spending category. If you want more data you can find it in the appendix of the Delta Project study. Public service: Activities established to provide noninstructional services to external groups. These costs are also budgeted separately and include conferences, reference bureaus, cooperative extension services, and public broadcasting. Student services: Noninstructional, student related activities such as admissions, registrar services, career counseling, financial aid administration, student organizations, and intramural athletics. Costs of recruitment, for instance, are typically embedded within student services. Academic support: Activities that support instruction, research, and public service, including libraries, academic computing, museums, central academic administration (dean’s offices), and central personnel for curriculum and course development. Institutional support: General administrative services, executive management, legal and fiscal operations, public relations, and central operations for physical operation. Plant operation and maintenance: Service and maintenance of the physical plant, grounds and buildings maintenance, utilities, property insurance, and similar items. 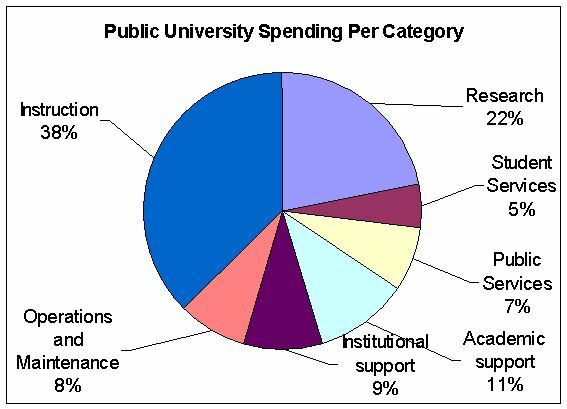 First lets look at the public research universities. Now lets look at the private research universities. While private universities spend a lot more money the amounts spent in each category are quite similar between the private and public schools. This rate of growth is pretty close to inflationary increases over all. The Delta Project tracks data on college costs and productivity. Their study on Trends in College Spending 1999 - 2009 has data on college revenues and the source of revenues. 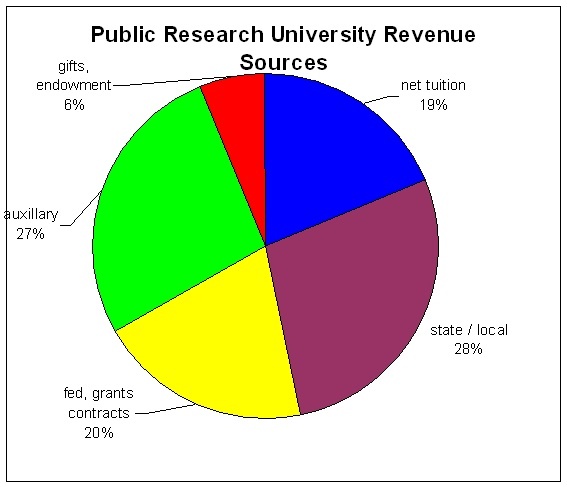 They break it down based on different sources of money as well as different classes of university. I'll look at Public and non-profit Private 'research universities' which are the major full universities that offer Graduate programs. The study looked at 152 such public schools and 99 private schools. The figures given below are all out of the Trends in College Spending 1999 - 2009 report. The dollars are based on average amounts per full time equivalent student. Net Tuition Revenue : Revenue from student tuition and fees less institutional student aid. State and local appropriations : revenues from local and state organizations excluding grants and contracts. Private gifts, investments returns and endowment income: Gifts from donors and money earned or taken from endowments. Federal appropriations, grants and contracts and state and local grants and contracts: Money from federal sources and state and local grants. Auxillary: Hospitals, residence halls, food services and intercollegiate athletics. First lets look at the source of revenue for Public research universities. 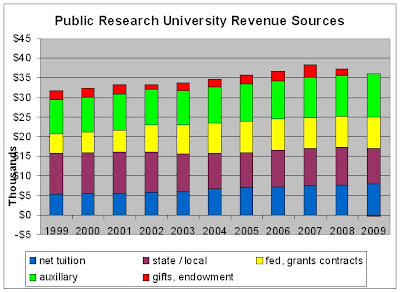 Altogether the revenue total for 2009 was $35,524 including loss of $387 from endowments. 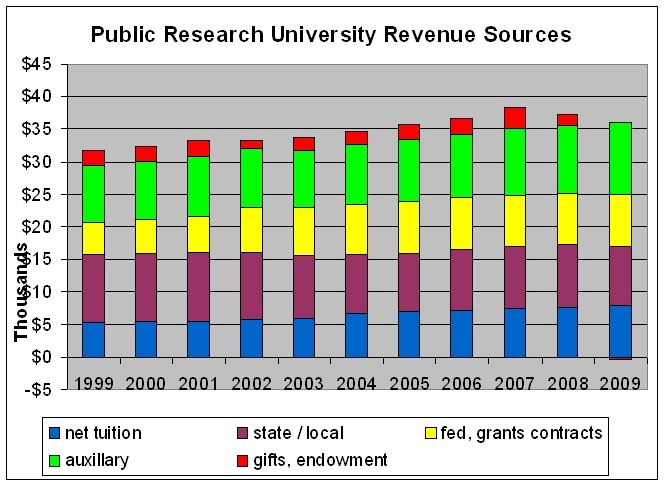 This is the total revenue of the public universities averaged over the student body. From 1999 to 2009 the net tuition rose about 50%. State and local appropriations are down around 15%. Federal money is up 60%. Auxillary revenues are up 25%. Public universities are heavily subsidized with over 50% of their You may or may not be surprised to see that net tuition only accounts for 19% of total university revenue. Total revenue for the private universities is $54,492 per student average excluding endowments. 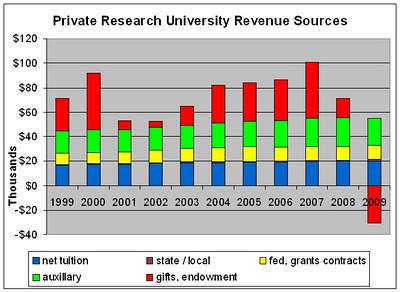 The endowments and gifts contributed anywhere from -$30,256 in 2009 up to a peak of $46,342 in 2007. Just because the endowment is up or down doesn't mean the university spent that much money. 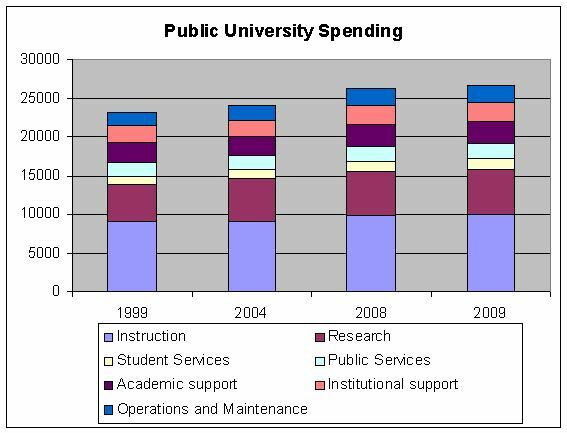 The endowment funds are not necessarily used as spending money but just reflect fluctuations in the universities assets. 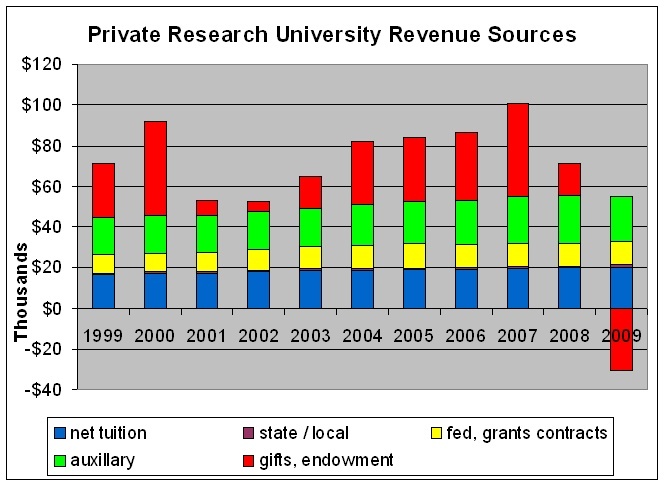 Revenue sources for private research universities are more stable growth across the board. Net tuition is up 21%, Federal funding up 23%, Auxillary income up 22%. The endowments dropped drastically in 2009 due to poor performance in the stock market and possibly lower donations. Interesting to see how much private schools get from federal, state and local governments in the way of support. A lot of that comes in the form of grants and contracts I'd guess.